At 4.20am UST on 25 May 2017, a teeny-tiny rocket lifted off from the Mahia Peninsula on the North Island of New Zealand. 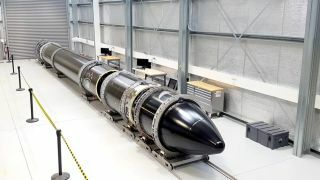 As it accelerated skyward, it ticked off a series of firsts: the first launch from New Zealand, the first launch of US firm Rocket Lab's Mini Launcher, and the first step in a journey to make it substantially easier for small companies to put satellites into space. This isn't competition for SpaceX. The rocket, named 'It's a Test', was just 17 metres tall – substantially shorter than SpaceX's 70-metre Falcon 9, or Nasa's 110-metre Saturn V that took men to the Moon. The design is made entirely of carbon composite, comes with a partially 3D-printed engine, and is not reusable. It carried no cargo, but has now proved that it's capable of hefting about 150 kg into orbit. That's not a lot – a high-end Earth observation or telecoms satellite weighs tons. But Rocket Lab's Electron launcher is perfect for companies that only need something simple in orbit. That means it can be cheaper. A Nasa launch can easily cost more than $100 million, whereas a lift into orbit from Rocket Lab costs just $5 million. If you don't mind sharing space with other satellites, a small cubesat that can perform basic experiments or take pictures of the Earth can be put into space for just $77,000. As well as big news for Rocket Lab, it's also big news for New Zealand. The country wants to become a low-cost space hub, and is well positioned to put satellites into polar orbits. Rocket Lab's launch suffered from bad weather conditions, but proved that the country's infrastructure can handle commercial rocket launches. "This is the beginning of the flight test program,” Rocket Lab founder and New Zealander Peter Beck told Wired.